Over all, I loved the movie. I really found it the best of the three, so far. Bryce as Victoria: NO. Really disturbing to have a character changing actresses in between movies. The scene where Edward was mad at Jacob for kissing Bella... I don't know, it worked out well, but, in the book he stays so cool and calm. I can't really explain it, but I guess to me it felt in the scene Edward became to much 'human'. The talk Bella and Jacob have at the end, it was good, but in the book you could really feel that after it, Bella was devastated. It was a bit tame in the movie, I didn't feel the loss which you do feel when you're reading. Bella is not crying, she just leaves and then next scene. The talk between Billy and Bella was priceless, absolutely loved it! There was a lot of humor in the movie. I think the wolves looked way better and believable. And Jasper, Alice, Rose, really great!! As I have read the book tons and tons of times, I immediately noticed changes between the book and the movie. But I wasn't disappointed. There were things I didn't like that much. But, still, over all, I loved the movie! ok, I have to be honest. I was not impressed with Eclipse, mabey i set my expectations too high, but a few key points were missing. bella/jacob kiss, the movie did not show that bella was doing this to stop jacob from killing himself. in the book jacob was more childish about it, manipulating the kiss. the movie made it seem like bella wanted this. this, for me was one of the biggest ideas in the book. that said... I loved everything about the newborns, meadow, cullens looked sooo much better, the past story of jaz and rose. but overall, I think it could have been better. the acting WAS great!!
" You are killing my buzz, Edward "
I saw Eclipse at the Midnight showing last night and LOVED it! Now I'm a pretty easy critic, I can usually take a movie for what it's worth...but still, it was good. I liked how they streamlined the movie...and left out of the over reacting Edward parts. You got the feel of it without it being strung out. I loved that they showed Esme looking awesome fighting! BUT #1. CHARLIE STOLE THE SHOW YET AGAIN! I <3 CHARLIE!!!! MRK wrote: BUT #1. CHARLIE STOLE THE SHOW YET AGAIN! I <3 CHARLIE!!!! Brienna wrote: The scene where Edward was mad at Jacob for kissing Bella... I don't know, it worked out well, but, in the book he stays so cool and calm. I can't really explain it, but I guess to me it felt in the scene Edward became to much 'human'. I don't really know how to explain it either, but I really missed the calm, cool, collected Edward from the book. 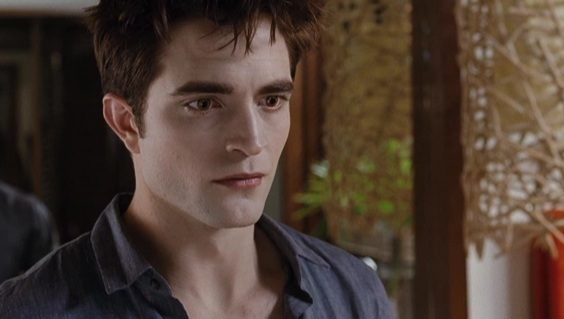 He was just worried about getting Bella fixed apposed to fighting with Jacob. He even stood up for him a little in the books telling Bella that if he were to hurt Jacob she would feel bad later. Which was the opposite in the movie, Bella was telling them not to fight instead of egging Edward on like she does in the books....Still loved it and Charlie was just great in this scene too. The look on his face when Jacob said he kissed Bella and then she broke her hand was priceless...Charlie really does steal the show! Why, in all the films so far, do they make Edward appear to be such a weak fighter? He was stronger and much more capable of defending himself in the books. I missed the relationship you see building between Edward and Seth when they fight Victoria and Riley in the book. There was none of that working together between them in the film. I loved Rose's and Jasper's back stories!! My other complaint would have to be during the tent scene...yes, Edward said he'd let Bella go if she chose Jake, but he also said he'd fight for her...and he'd always be waiting because Jake could always imprint on someone else. I missed that in the movie!! The end of the movie, the scene in the meadow, almost made it seem like Bella was saying she wanted to be a vampire more than she wanted to be with Edward for eternity. What was that about???? Biggest disappointment for me was right there. I know it seems like a lot of complaints, but I'm in the analyzing stage stage so it's easy for me to pick out the things I didn't like! I tend to always think books are sooo much better than movies! But I really do think that overall, it was good! It feels like each film is better than the last, especially the acting! I think all of the actors are becoming even more comfortable with their charaters as time goes on. It makes me super excited for both Breaking Dawn films!!!!!! fanMNM wrote: My other complaint would have to be during the tent scene...yes, Edward said he'd let Bella go if she chose Jake, but he also said he'd fight for her...and he'd always be waiting because Jake could always imprint on someone else. I missed that in the movie!! I agree w/both of your points here. While watching the tent scene I was waiting for Edward to talk about that. So for the most part I really liked it. I just got done seeing it so here's my initial thought/reactions. At first I was worried when I heard that DS was going to direct it. Especially because I haven't seen any of his other movies & that the previous movies were pretty much horror. I wish they had the scenes w/Alice trying to convince Bella to let her plan the wedding. And then when Bella tells Alice she can & Alice already has a dress for Bella. Those are my two favorite Alice moments in the whole saga! I liked the NM wolves better. I had read in some reviews that they were better here. I don't agree. I wish Jacob was more cocky after the first "kiss". And that he "attacked" her more like in the book. That was one reason I hated Jacob in the book. The proposal was pretty good but I felt like there was something missing. I'm not sure what since it's been a while since I've read it. Hmm......But I did love how he talked about in his time he would've courted her. Loved Rosalie's & Jasper's backstories. Although Rosalie's seemed kind of short (especially in comparison w/Jaspers.) Except that it didn't have Jasper's "I felt hope" line. That is just wrong!!!! Rosalie's really made me feel for her, I almost cried. It was good & terrible that the same time. (Does that makes sense?) And I was glad the wolf legends were shortened. I always have a hard time reading that in the book & usually skip over it. Billy as Charlie was awesome like always. He had some good/funny lines/scenes like he usually does. I think I like Charlie better in the movies than I do the books because Billy is so awesome! I was happy that there seemed to be a lot more direct/very close lines from the book in this one. I really really really loved it. They got it really close to the book and that made it better. The additional bits that they did add in did not take it away from the movie. Ill be back to edit this later. I finally saw Eclipse yesterday at the dollar theatre. It was better than expected. There were only a few people in the theatre (school's back in session and I went to an early showing--I saw New Moon in the same theatre and it was packed this spring), and the film was better than expected. Eclipse is my least favorite book of the saga--I just didn't click for me like the others did. It's not that I didn't like it, but it's not my favorite. The film, though was in some ways more interesting--maybe visualizing it helped me overcome some of the things that irked me somewhat about the book (the overt action violence and conflict). Kristen was amazing, Rob and Taylor were very good as well, and the supporting cast did their jobs admirably as well considering the source material and the fact that David Slade has had little expirience with PG-13 rated romance thrillers like the Twilight Saga films are. Speaking of which, Dave needs to be given a hand for making it work and adapting to cicrumstances and having a creative synergy and chemistry with the cast. Catherine and Chris had the same, and all the films have appealed to me. Twilight had the mystery, scary element and indie film roots, New Moon was beautifully cinematized and focused on the emotional storytelling, and Eclipse did the best of both, albeit not with much indie film stuff in it. As I said, Eclipse isn't my favorite novel (New Moon and Breaking Dawn are tied for first, Twilight is a very close second, while Eclipse is a little ways back in third), not a bad novel, just not my absolute favorite. But I might have to reconsider that a bit after seeing the movie. WOW!! I can't believe it's been an entire year since I first watched Eclipse!! 365 days ago I went to the triple feature and I was on pins and needles all the time till Eclipse started, when I froze to my seat and couldn't move at all till the credits were over. Now we have only 142 Days left until Breaking Dawn Part 1 comes out !!!!!!!!!!!!!!! And I bet I am going freeze so much this time that I'll look like a petrified Volturi !!!!!!!!!! !